Craft business owners live for the seasonal craft fairs and trade shows that allow them to showcase their goods during the holiday buying season. But if you decide to exhibit at one of these events – and why wouldn’t you? – remember that the craft fair or craft show will be packed with men and women displaying their finest crafts. First, try as hard as you can to get a space near the main entrance. That way you’ll be able to “wow” people whether they’re coming to the show or leaving the show. It’s also a way to engage attendees in conversation. 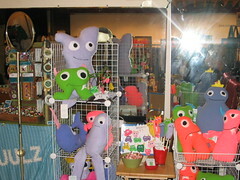 For instance, if someone walks into the craft fair and he or she looks lost, you – stationed at your booth – could say something like: “Are you looking for a particular type of craft?” If he or she responds, you might be able to compel him or her to take a look at the products you have available in your booth. Another tactic to employ involves having a unique booth to display your crafts. If, for example, you can do whatever you want with your booth, feel free to customize it to make it look very different from all the other booths at the show or fair. That way, attendees will naturally be drawn to your booth out of curiosity. Also, make sure everyone who is working in your booth is on their best behavior. If you can, make sure there are enough people so you can do shifts – taking turns during the show. Standing on the hard floors of a craft fair can be tough, so you want to make sure you have a chance to rest every couple of hours. And make sure your booth staff is trained to greet people and answer any of the questions that may arise. A little pre-show training will go a long way in preparing your booth staff for the show. In terms of what you bring to the fair or show, bring a wide selection of your best crafts, at a range of prices. Different craft shows will have different price points that sell. For some, it could be a lot of smaller items, priced from $1 to $10. Other craft fairs do a good job of attracting crowds ready to spend significantly more. Once you know a show, you can plan accordingly. But remember… there will always be a market for low-priced items, so you'll want to bring a lot of these high-volume sellers. Another surefire way of attracting potential customers to your booth is to run a raffle for a free prize. You don't need to go overboard with the prize, but try to make it seem valuable enough for people to want to enter. Everyone likes to receive free goodies, so you can be sure that people will stop by your booth and enter win a prize. And, a contest serves double duty as you are also collecting contact information from the people entering the contest. And make sure you collect email addresses as this is the cheapest way to stay in contact with customers and potential customers. And finally, you absolutely must bring sales materials to hand out. People who go to craft shows like crafts. So the people who attend are your target market, even beyond the day of the show. You need to have brochures and flyers to hand out to anyone who wants them, complete with a story about your craft business, and contact details (including your online web address) so people can get in touch. Craft shows and craft fairs offer excellent opportunities to showcase your unique crafts and to make some sales. But ultimately, your craft fair booth – and how you present yourself and your craft business – are as important as the crafts you make. wow, these are fantastic tips! Crafts shows can be such a mixed bag. If you don’t have a nice craft booth, you won’t get any traffic, and if you get lots of traffic, you need lots of promotional materials. It’s great to see all the different ways people are making money selling crafts! Thank You, for a very impacting online craft business presentation. It was very informative,sorry i miss the actual phone presentation, but am glad i took the time to listen to the recording. By the way, have you seen my handmade flower vases crafts? they are unique and beautiful with a different flow, i make them from discarded juice and milk cartons ( recycled trash). Tell me what you thing about that?